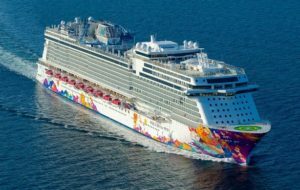 Dream Cruises debuted their World Dream cruise ship on November 19, 2017. Dream Cruises is Asia’s newest luxury cruise line that caters to an affluent Asian market, including families. They now operate two mega cruise ships that offer itineraries throughout Asia. Dream Cruises’ parent company is Genting Hong Kong, the same company that owns Star Cruises, Crystal Cruises, and Lloyd Werft shipyards. Genting Hong Kong also owns an 11% stake in Norwegian Cruise Line Holdings. In 2015, Genting Hong Kong founded Dream Cruises as a luxury brand catering to a high end Asian market. They introduced their first cruise ship, Genting Dream, in November 2016 and one year later their second mega ship, World Dream, started her maiden cruise with an itinerary that includes the Philippines and Vietnam. Both of Dream Cruises’ ships each accommodate 3,350 passengers and 1,700 crew. The brand offers their guests high levels of service and spacious comfort. Onboard, there are over 30 restaurants, 4,000 square metres dedicated to spa services, a waterslide park, ropes course, bowling alley, and children/teen programming.